Last edited by kraken973 on Sat Nov 02, 2013 7:50 pm, edited 1 time in total. Re: MACHINECA F New MMS? I remember that figure popping up during WonFes Winter 2012. I think we concluded it was a third-party, non-related figure. Seeing the inner frame now makes me think it's closer to a 1/6 figure than the nominal 1/12th of the MMS line, so I'd have to say it's unrelated. Also, for the record, WonFes isn't just for MMSes; it's for all figure lines. 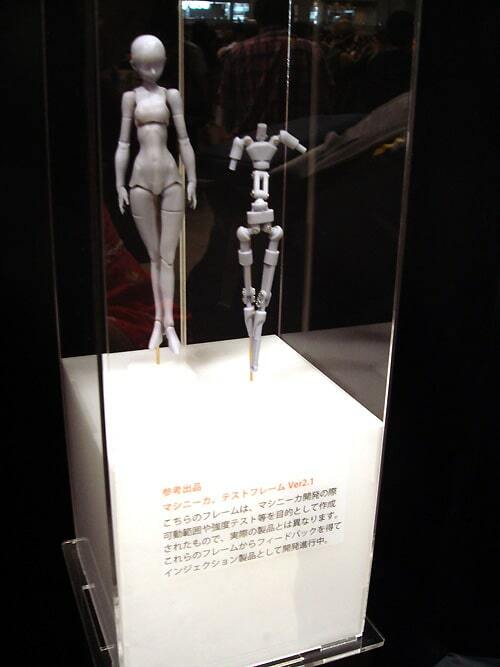 Klinkin wrote: I remember that figure popping up during WonFes Winter 2012. I think we concluded it was a third-party, non-related figure. Seeing the inner frame now makes me think it's closer to a 1/6 figure than the nominal 1/12th of the MMS line, so I'd have to say it's unrelated. Also, for the record, WonFes isn't just for MMSes; it's for all figure lines. Last edited by kraken973 on Sat Nov 02, 2013 11:24 pm, edited 1 time in total. OH YAH! I remember seeing these on the stage displays. I always wanted the figure that they use to come with the stage. Anyone know if they ever just sold the figure? I'm more interested in the realistic 1/3. If you have any pics of a finished one, let me know. di:stages are by GSC by the way, not Bandai. Roku, those figures are Archetypes painted in gray. They even have the same clear joints. Huh. That's a rather impressively complex frame for such a small figure. I still doubt it's related to MMS, though; there are some visual similarities, but looking at the frame, the hip joints are completely different and lack the MMS's trademark swing joint. It might be interesting to see if some MMS compatibility could be kitbashed into it, but unless we have official confirmation otherwise, I'm pretty confident this is unrelated to the MMS figure. This is an attempt to make a better body, not make the same beginner manufacturer's flawed 7-year-old toy-like design we always had. RokuShinkiMaster wrote: OH YAH! I remember seeing these on the stage displays. Shiaoran wrote: I'm more interested in the realistic 1/3. If you have any pics of a finished one, let me know. Shiaoran wrote: di:stages are by GSC by the way, not Bandai. Shiaoran wrote: Roku, those figures are Archetypes painted in gray. They even have the same clear joints. Klinkin wrote: I'm pretty confident this is unrelated to the MMS figure. Or for new product. They don't have the license Busou Shinki. If im going to pay that much then im just going to stick to shinki's. kraken, me and Roku are talking about the figures in the official di:stage photos (I think), not these MACHINECA. Maybe she's mistaking the MACHINECA for the same ones in the photos because they're all gray, but they're not the same. Archetypes do increase in price. Your best bet is getting the She Next and waiting for He Next.